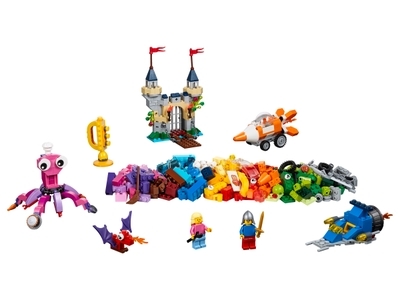 Help your child think bigger, build bigger and use their creativity with this special edition underwater-themed LEGO® set, featuring a range of colorful bricks and elements, plus a unique 60th anniversary LEGO tile. No matter how big a child’s imagination is, expand it with LEGO bricks. This cool toy for kids offers varying levels of building complexity for all ages and includes 2 minifigures. What will your big thinker build? Price is 17% above the initial Lego retail price! This comes down to 5.70 cent per brick. The Ocean's Bottom (10404) Lego set is available from the sites below. However, they do not offer delivery to your selected region. The Ocean's Bottom (10404) Lego set is no longer directly available from the sites below. However, 3rd party partners of these sites might still have the set available. Alternate description Inspire your child’s creativity with this special edition LEGO® set! Accessory elements include a sword, wizard's hat, pie, hammer and wrench, cleaver, round shield, broom, carrot, hairbrush, 2 mugs, frying pan, chicken leg, flippers, knight’s helmet, space helmet, 2 wigs and a fish. This special edition cool toy for kids is suitable for ages 5+.